One of my form have many inputs and user need to scroll down to reach till the end of form. I need to implement auto scrolling, for the page, so that when user, reach a input filed at the bottom of page, it automatically scroll up to expose the remaining fields. Below is the code, which use jQuery animate to implement vertical auto scroll. We have scroll_to method, which take two argument base and target . base is the element to be animated, target is used to calculate height from top , we need to scroll up . So, say as in below example, when user click on city input box which is at the bottom, the page will move up, taking city input to top of the page, So exposing other input element below it. Similarly, I have a popup in which designation input is at bottom, so scroll_top is called on it. like $(‘html,body’) or $(‘.modal-body’) you can trigger auto_scroll on any element, provided that element have certain height set,which is less then required by whole content, triggering the scrollbar. I have implemented, the autoscroll basically for my popup. The problem, I faced there is that, the target(designation input) top position keep changing with each scroll. say, first time the popup get open, I clicked designation input (say it is 500px below the top), it moved up, so now it is 0 px from top, now you close the popup, again open the popup, now this time scroll not work as, it will try to move 0 px, which is equal to no scroll. So, I modified the scroll_to method as below. Here, the height to scroll, will be sum of target position and height of the scroll relative to the base. Everything working fine on staging server, testing was complete. We have decided to move ahead with deploying our product in production. Heroku is decided to be our production server. We have made some changes, needed by herkou, and some other for our own foreseen benefits. Some Important changes are. Next day…I loged in to staging server..pull the current code on git..and restarted the staging server….BOOM…server crashed with below message. Error message is self explainatory….”safe_yaml file is not getting loaded“. When you start your application server, It try to load all the gems and there dependency gems. So here, it is failing to load the safe_yaml gem. Well solution is simple then. just install the safe_yaml gem and it should work. But what the hell…safe_yaml gem is allready installed. If you read the error backtrace properly, You will always get clue….so first thing first….what is the error message…. safe_yaml file is not loading. well that, I knew from beginning. What, Iam doing wrong in my approach is linking it with pg, unicorn and Procfile added one day back, as everything fine before that. But, NO..they do not need safe_yaml. 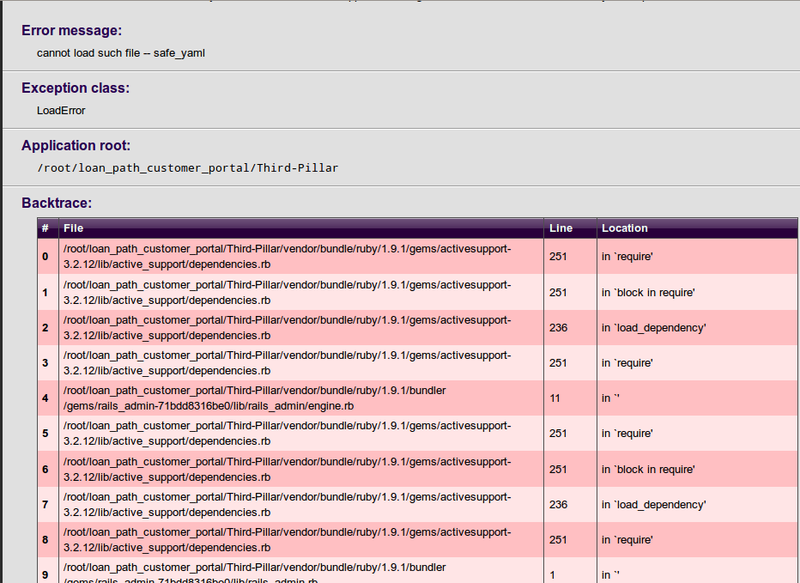 If you see the log, you will find that, actually rails_admin gem trying to load it...see line 4 of the image above. So, you can see that, safe_yaml and rails_admin is installed at different location (see the bold part)and rails_admin trying to load safe_yaml relative to its current path. The location of the the two gems get differed, due to way the rails_admin included in the gemfile and the way bundler install them.when a gem is fetched from gem source, it is installed to gems folder , and if from some specific repository, it get installed to bundler/gems folder . gem ‘rails_admin’, :git => “http://github.com/sferik/rails_admin.git&#8221; # bundle install command will install rails_admin to /bundler/gems folder of rvm or the vendor folder of the project, and since safe_yaml is one of its dependency, will get installed to gems folder of RVM. SOLUTION : My problem is solved by removing the git source from the rails_admin, letting it to be fetched from the gem repository, so that both rails_admin and its dependency get installed in the same folder. I have explained the need of background job and when to use it in this post. We need background job worker to execute our background job. I have explained installation of resque here and sidekiq here as job worker. I will explain pushing your time consuming jobs to background with respect to sidekiq. The flow will remain same for resque also. The feature requirement is related to loan application to a bank. You application provide, interface to user to fill up details like name, bank account number, ssn, address etc. on submit of form it go to create action, where you make API call to bank, who then try to save the user detail in there DB and return response as success or failed with related message. I am just showing structure(in reality it have hundreds of lines of code with complicated logic of validation and other security safeguard) of my current controller code, without any background job. Let us see our code without any background worker. flash[:notice] = "Credit Request Submitted Successfully"
flash.now[:error] = e.message.present? ? e.message : "System encountered error,try later"
We have separated the code related to making API call, to another file lib/loan_path/application.rb. Its content is as below. rest_resource.post payload, :content_type => "application/xml"
Iam lucky here , that my initial design already have, the required code in a separate class Application as you see above. So, what is happening here. in create action we are passing the details filled by the user to apply_credit method of application class, which then convert it into xml payload, and send it to Third Party through restclient call. Till the time response come, user remain on the new page itself, with a rotating image with message , your request is processing. If everything fine I redirect the user to loan index path and if the third party raise some exception, I catch the error message and render the new action. You can see that, I have set the timeout to 90 second , so you can understand how time consuming process it is. This is just an example of a method you should better run in background. You may have any other method in place of apply_credit method here. So, now we will better our design and process, the apply_credit task in the background. The flow here will be like this. => If status is success, we redirect it to loan index path as usual, but if failed, we need to capture the error message. The problem here I faced is that, sidekiq do not return any error message but only the status. The message need to be set by you only. So you need to capture the exception in apply_credit method, instead of controller as we are doing it above. Now, since you have captured the exception yourself, It will never fail in background ..so always return the status to be complete. The workaround here is to, use store method of sidekiq, which allow you to define variable, set and retrive value from it. Things get clear when you will see the code below. at 100,100, status_message.last if status_message.last.present? lp_status = status_message.first.present? ? status_message.first : ""
"System encountered error, please try later"
line which push the job to background and return you the job Id. status = status.present? ? status : "NotReturned"
lp_status = lp_status.present? ? lp_status : "NotSet"
# seInterval is jquery function which repeat the code within it. Categories: design pattern | Permalink. I have explained the need of background and when to use it in this post. here I will explain installation , starting and stoping of sidekiq and then its authentication with devise.sidekiq gem is available here . A sample example code of background job using sidekiq is available here . Assuming you are working with Rails 3 add below to your Gemfile. If you are working locally you can start it with below command. To stop it just press cntr + c . Even if you close the terminal it get stop. This will cause problem on server as there you want it to keep running all the time. So we need to run it in background. It can be done with the below command. As per this commit of sidekiq, it iinherit development environment by default. So If you are starting sidekiq on any other environment say staging or production you must pass the environment also otherwise sidekiq not inherit the environment. So use below command, which start sidekiq say in production environment. since, now the job is running in background, It will always keep running, even if you close the terminal. kill those process with kill command as below. NOTE: you should stop and restart the worker, whenever you make changes to the code executed by the worker , otherwise it will execute the old code only. So, to be on safer side when ever you deploy the code to server, restart the worker. Go to browser and go to http:://your_site_url/sidekiq you will see the sidekiq dashboard. but the problem here is that everyone can access this page. It is the page which have detail of sensitive data and running process, so we need to make it accessible only to admin. Thus I have first checked that the user should be loged in and when loged in they should be either admin or a monitor. you must have admin? and monitor? method defined in your user model, which contain logic to check whether a user is admin or not. For example, Iam using rolify gem and so I have implemented my method as below. I have explained the need of background job and when to use it in this post. here I will explain installation , starting and stopping of resque and then its authentication with devise. resque gem is available here . You will also need resque-status to know the status of running job. resque status gem is available here. Say, if my application is created with the name MyFinance, my routes will look like this. resque comes with a number of rake task to perform different resque task from the commandline, like starting stopping the worker etc. To load these task, you need to add below line to Rakefile. Once , you have added above two line to the RakeFile, You can see all the available resque rake task with below command. rake resque:workers # Start multiple Resque workers. Go to browser and go to http:://your_site_url/resque you will see the resque dashboard. but the problem here is that everyone can access this page. It is the page which have detail of sensitive data and running process, so we need to make it accessible only to admin. You can introduce simple http authentication by creating a file with any name(by convention use name which reflect content and purpose of file so call it resque_admin.rb) in config/initializer and add the below lines to it. Recently, I have to restructured my code design due to request timeout error on Heroku. We have decided to use Heroku as our production server. Our staging and other instance are running on nginx+apache in our own server. We do have long running process which make third party API calls. The API is slow and take longer time to return the response. We have handled it by setting request timeout to 90 s. So our server wait for 90 second before throwing the request time out error. But this piece of code crashed on heroku. Heroku has maximum limit of 30 second for response to return the first byte and it is not configurable, so you can’t increase it further. It is explained here . Heroku is right in its own way. Why they should pay for your poor design. Any request taking more then 10-15 second is crime in itself, in today’s fast pace world. So the idea, is to process time consuming request in background. These are the job which do not need you application to process its output i,e you are just concerned with the result: failed or success. In this case, You push the task to the background. configure retry, to try the failed job set number of time. If you want, you can ignore the failed job or write code to start it again. You application have dependency on output of these job. Here, You need to keep user on the same page with showing progress bar or rotator and through ajax call keep checking the background worker after, say every 3 seconds about the status of the job, If it is success, you redirect to some other page and if failed, you render the error message to the user. Choosing between available background job processor gem. Below is few gems available which handle background job and are very easy to use. The complete list is available here on the rubytoolbox. I have listed the gems in order of there popularity. I have used both sidekiq(explianed here) and rescue(explianed here) in my project and found both of them are very easy to use. A comparative analysis of resque and sidekiq is available here , choose whatever suits you. Lets below is our simple form with one input field with id = dob and a submit button. We will going to validate date for its correct format (assuming dd-mon-yyyy format) and other things like, it should not be less than the current date. var msg = "Date of Birth is valid"
msg = "Date of Birth must be entered in this format: DD-MON-YYYY"
msg = "Date of Birth day and year can have only numeric value"
msg = "Date of Birth day should have value in 1-31"
'Jun', 'Jul', 'Aug', 'Sep', 'Oct', 'Nov', 'Dec' ]"
msg = "Your Date of Birth can't be less than Today's Date"